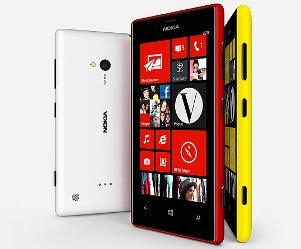 Nokia Lumia 720 comes with a 4.3 inch WVGA LCD screen and is powered by 1 GHz Dual-core Snapdragon S4 Processor. It comes witha 6.7 megapixel camera with F1.9 aperture and a Carl Zeiss lens. It has Gorilla Glass 2.0 and Super Sensitive Touch which allows users to use the phone with their fingernails. Its amera has LED flash and is capable of HD video recording at 720 pixels at the rate of 30 frames per second. It has a Skype HD wide angle front camera with 1.3 megapixel range. Lumia 720 comes fitted with 12 MB RAM, 8GB mass memory and support for micro SD cards up to 64GB. It also comes with 7GB free SkyDrive storage. It laso has apps like Cinemagraph, Smart Shoot and Glam Me.